The Caventi collection is an elegant addition with sophisticated chrome arms and suspended teardrop crystals. A touch of class to any dicor. 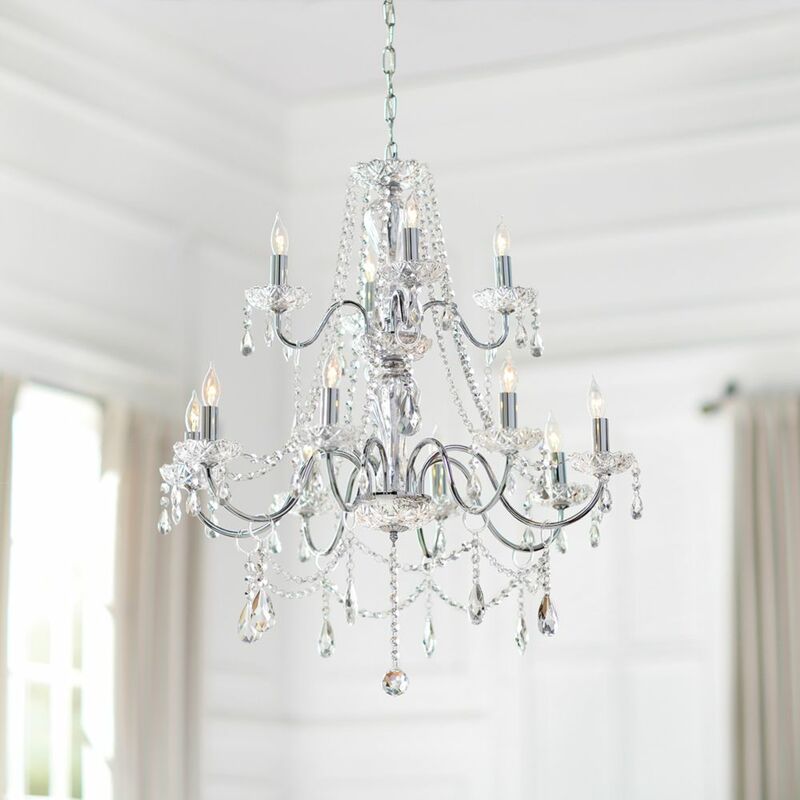 Caventi 12-Light 60W Chrome Chandelier with Teardrop Crystal Accents The Caventi collection is an elegant addition with sophisticated chrome arms and suspended teardrop crystals. A touch of class to any dicor. Caventi Collection 12 Light Chrome Chandelier is rated 5.0 out of 5 by 1. Rated 5 out of 5 by Alana from LOVE THIS CHANDELIER!! I am not particularly handy, but managed to put this together in about an hour. A bit fussy, but not difficult. Directions were easy to follow. Exceeded my expectations once put together and hanging. Looks like it should cost much more than the price point. GORGEOUS fixture! Does anybody knows how long is the chaine from the actual light to the ceiling? I'm not sure exactly how long the chain is, but if you have an 8' ceiling, it's long enough to hang the fixture just above the floor. You need to cut it to suit your installation. The instructions for this light are not accurate. &nbsp;It indicates there is green,red, and white markings but there are none. &nbsp;There is one metal wire and 2 transparent wires that look exactly the same with no markings. &nbsp;What am I supposed to do with this? Hello Tommy. We always recommend you use a Certified Electrician to do any electrical work as their knowledge and expertise will be extremely useful and complete the job in a safe manner. The copper wire is the ground wire, one of the transparent wires is SMOOTH when you put your fingers along it, this one is connected to the black wire from your home. The ribbed/bumpy one is attached to the white wire from your home as this is the neutral wire. Hope that helps! how long is the chain that comes with this? Yes Michaela, this product is dimmable. Are there directions on where to attach each of the crystal pieces? The instruction manuals are available for download above (on the right side of the product overview). I got this crystal chandelier in a week ago and I just found that there is no markings on the clear wires to indicate black (hot) or white for ceiling wire connection. There are only two clear wires and one metal wire (ground) found in the light. Thank you for choosing a Eurofase fixture. Please note that all light fixtures should be installed by a qualified electrician. The ribbed side of the cord connects to the white wire. The black wire connects to the smooth side of the cord.